I seriously don't think that I need to review this HD blush line from NYX because of the countless reviews on the internet. I honestly am not an HD girl. Never really got into the hype in a way that I would clamour to try the newest HD line out there. I learned a long time a go that if you know what you're doing, you're likely to get the result you want, no matter what product you're using. Just so happen that we are in world where in HD is newest thing and almost everyone is using HD Technology. Heck, even my mobile has one. You see, HD is more crisp and clear, giving a better viewing experience. months back (I think it was the Cosmetic Expo thing) and asked her what nice pink blush she could recommend and she did so by mentioning Apricot from the famous HD line of NYX. I'm impressed with how familair Sol, Paul and assistant were with the shades of their products. It's nice when you get immediate answer from the seller about their merchandise. It's makes the shopping a lot easier. Of course, I picked up Apricot from her testers and it was love at first swatch. Despite the Php750 price tag (given that this is after al from brand known as a drugstore brand), I bought it and took it home with me. Packaged in a twist cap container that snaps into place (so you know that the lid is tightly closed), the pressed blush is trapped in a grinding mechanism much similar to those home TV shopping vegetable cutters. Twisting the rim to the right to slowly dispenses shards of powder. Love this, because you have control over the amount of blush you need and makes less of a mess compared to it being in a powder form. Grinding pots also makes this blush easy to tote around on your travels or even just to keep in bag. Looking for mirror? Don't fret. Inside the lid, you have a good size mirror. This doesn't come with a brush though. 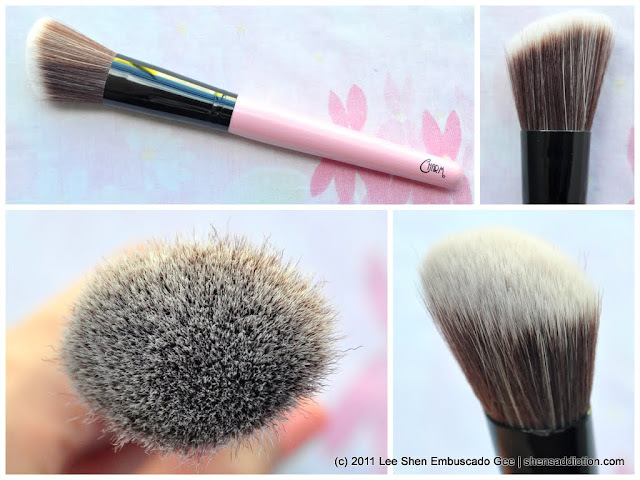 No worries because you can use your regular blush brush or angled blush brush for this product. I use my new favorite from the Charm Luxe (about to be released this week!) for this blush. I like using synthetic brushes because it attracts a good amount of color and delivers it all to the skin. This gives me a pop of color immediately. Yes, I tend to overdo on the blush front most often since my oily skin seem to wash it off easily. Applying a bit more assures me a bit more mileage on my blush. Now on how Pink the blush is... I can say that the matte pinkness of the NYX HD Studio Photogenic Grinding Blush in Apricot impressed me. Although it has tinge of peach in it, against my skin, it appeared like a pink flush. A color I find that compliments my cheery personality. When I was researching I thought the English Rose from the same Blush line from NYX would have been a nicer fit but I realize that it was too pale for the type of Pink Blush I was on hunt for. What I want is a bright hot pink blush, I guess. Good thing, my BBFF Jheng, has English Rose.. will try to borrow hers and see if it's as pale as I thought. So far, this reminds me of Bobbi Brown's Blush in Nectar... Correct me if I'm wrong. I love the sort of natural feel of how NYX HD Blush in Apricot looks on me. I think pink-peach really suits my skin tone. NYX HD Grinding Blush really blends well to the skin, buffing it in with a synthetic brush or swiping it with a fluffy blush brush is easy. No-brainer application, really. It gives a flawless look which makes me feel as if my pores are less visible. What's best is that, given that it is in powder form, the blush is really pigmented... a little goes a long way. Dead sure, it would take awhile before I finish this up. Back before I was blogging, I always thought that pink blushes weren't good for Filipina skintones. Reading it from magazines, watching it from shows made me feel as if my Asian skin is only fit for peach and orange base blushes. Of course, it suits us better... but if not for being adventurous and trying something new (at least in makeup), I never would have thought that pink blushes to work on us Pinays. Even some of my friends who have golden tan skin uses pink blushes in gradations that are perfect for them. 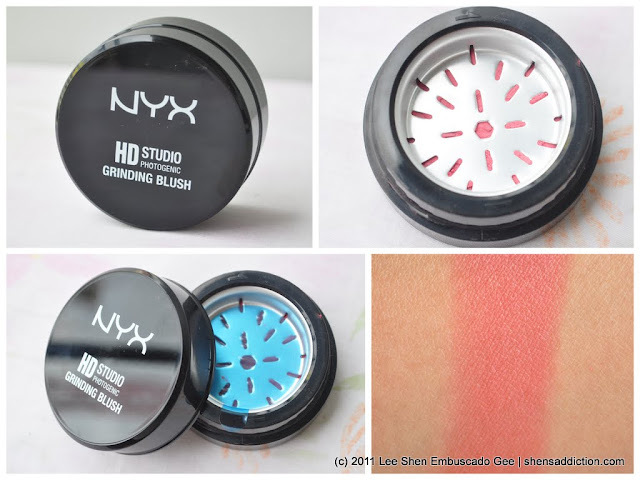 I am still on a hunt for that perfect pink blush but I'm sure glad I have NYX HD Studio Grinding Blush in Apricot to keep me distracted for a little while. Can you recommend a nice pink blush? I do love NYX. This blush looks great. i have obsession from ellana, sorta reminds me of this. Thanks for the review! I've been eyeing these blushes! Pink looks great on you! the colors shows up nicely - sadly i really hate loose anything na! hayst... but maganda ha, pwede pangregalo! magkano siya sis?